One thing I wanted to do with this blog was to make it about home cooking, not just gourmet cooking. Home cooking isn’t about doing everything by scratch, well at least the non-idyllic version isn’t. Home cooking is often about finding shortcuts and having dishes that are easy to make after a long day at work. The following dish is all about shortcuts. First, I started with fresh frozen ravioli from Alcamo’s in Dearborn. The ravioli I like from Alcamo’s is the chicken portobello mushroom. It has diced all-white meat chicken breast combined with diced mushrooms. They are excellent, but run $10 for a package that serves two. If you don’t have Alcamo’s in your neighborhood, than any store bought cheese ravioli works. 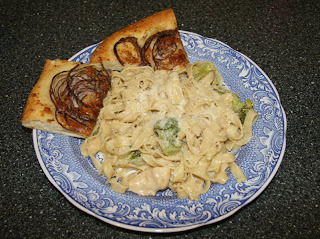 I was going to accompany the pasta with my homemade Alfredo sauce, until I realized my heavy cream expired last week. So, I went with a backup sauce packet. 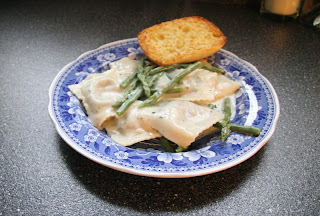 Knorr’s garlic herb white sauce actually works very well for store bought ravioli. I did add some fresh asparagus and Parmesan Reggiano to bring some fresh elements to the dish. There are a lot of dishes that come together without much effort. This was just one of them. I hope you find it useful if you ever are in a pinch. Here is a simple pasta recipe that only takes 20 minutes to make. I highly recommend fresh pasta or at least the refrigerated pasta you can find at gourmet markets. If you’re local to SE Michigan, definitely add Ventimiglia Italian Foods in Sterling Heights to your shopping routine and pick up some of their fresh Fettuccine. Boil enough water for the Fettuccine; add a few dash of salt to the water. Heat the butter and olive oil and cook the chicken in a sauté pan, turning to brown both sides, 10 minutes. Remove chicken from the pan, set aside. Start the sauce, using the sauté pan you cooked the chicken in (do not wash). Add the butter and garlic to the pan on medium heat. Once the butter is fully melted add the heavy cream and Parmesan to the pan, mixing the sauce with a whisk. Add the grated nutmeg and salt and pepper to taste. Once well blended, get the sauce to a boil and then reduce heat to low and stir occasionally. Put the broccoli in a small pan with water barely covering the vegetable. Add a dash of salt for flavor and heat the pan on high heat. Once boiling, let it cook for two minutes and then remove broccoli. Add the broccoli and chicken to the sauce. Now, add the fresh Fettuccine to the pasta water that is boiling. Cook the fresh pasta for about 3 minutes and add the Fettuccine to the sauce in the sauté pan and mix the pasta and sauce together to fully coat while still in the pan, this is easiest if you add the Fettuccine in small batches and toss, repeat. Serve the pasta and add some chopped parsley and sprinkle with more Parmesan. Add some garlic bread or focaccia slices to complete the meal.